I missed all my followers and friends nonetheless i am back.Gone for a minute, now I am back! 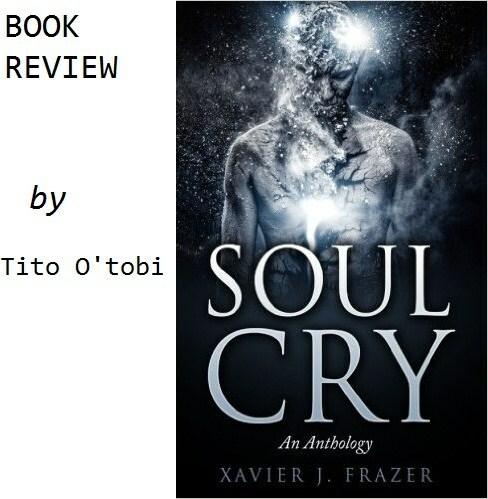 “Xavier J. Frazer’s anthology titled Soul Cry is 139 pages of excellent poetry delivering effortlessly beautiful poetry with simple words that speaks to everyone. This is one poetry book that anybody will relate with. It’s comparable to Tolu Akinyemi’s Poetry for Dummies. However, Soul Cry talks about deeper social issues than a dummy will want to think of. From the very first poem, Soul Cry (page 17) talks about “a kind of hopelessness where even the truth is only a fabricated lie”, showing the pretense of living with smiles underneath a burdened mind. It’s the state of the world today. We’re all crying for answers but we have to wear a smile. Footprints (page 21) and Black Lives Matter (page 133) and Black Women (page 129) celebrate the beauty of the black race and her resilience at having overcome multiple forms of injustice over centuries. However, Footprints is also a thought provoking piece on the unintended effects of slavery, like “black people now purchasing our shackles and chains at the stores”. Click (page 23) and Thought (page 30) are high points in this anthology. While Click is a deep piece on social media and the intellectual drudgery it can cause, thought is a generalized poem that shows accurately the despair of society through the somber tone of the book. Faces of Paradise (page 83) and Jamaica Cries (page 34) shows the patriotic cry of the writer’s soul. If this book was a musical recording, Paradise will be the B-side to Jamaica Cries. Literary War (page 33) is the writer’s soul cry. The language is simple in this book, and I find that beautiful. Most poets fall into the trap of trying to use some complex form and assortment of words maybe in an effort to sound genius. This is a book that makes little effort in that regard. The language is easy to understand; it’s raw and ungarnished and makes no apologies for being raw and ungarnished. The poet uses this simplicity of language to bare out the soul in Soul Cry through this simple use of language. Also, the reader may or may not notice a few typographical errors, notably in Epitaph (page 46) and Black Lives Matter (page 105); those are the only two I saw. The poems are not written to follow a particular metric order and the stanzas are irregular. Of course it does tell on the beauty of the poem but it doesn’t undermine the brilliance of the poet. Reading Soul Cry is like finding a rough uncut diamond the size of your head. It’s not polished, not sparkling on the shelf of a jewellery store but it’s still extremely valuable and it’s still a beautiful looking diamond. Other noteworthy poems are Sun and Moon(page 54) which I consider a really good poem about how love can be beautiful when we know our roles in it. Prisoner of poverty and Warrior (page 133), A Poet (page 137) and An Idea (page 66). In my opinion, Concrete Rose (page 27) is the biggest low point of the anthology. In this poem, the writer simply descended to good rhymes alone. Also, it sounds like a not as brilliant imitation of Tupac Amaru Shakur’s 1993 poem, The Rose that Grew from Concrete. However, this doesn’t take away the brilliance from the book in it’s entirety. It’s just one really low point out of over 60 poems. Epitaph (page 46) is also such an outstanding poem that I might consider having it on my tombstone when I die.